Memoria Press gave me the great pleasure of reviewing their Famous Men of Rome Set. This set is geared for kids in the 4th to the 8th grade. The entire set is at a low price of $39.95, which includes the reading text, the teacher guide, and the student work book. The book has 30 stories that start with the founding of Rome to the demise. The workbook has 30 lessons which include famous quotes, key people and places, vocabulary words, some comprehension questions, then an activities section. I used this with my 4th grader. She was a little reluctant when I first gave her to story book. The names of the people were intimidated her since it was hard for her to pronounce them. She fought me a bit on reading it but I kept insisting her to continue. 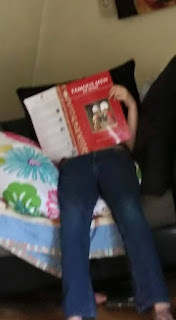 It tool us awhile to get through the first chapter as she still was not feeling it but about half way through she got super quiet and the complaining stopped. I went about my business with my other daughter and up she runs to tell her sister what happened in the chapter and ir was so cool. She has so much shine in her and she was so amazed by it. This set the pace for the rest of the chapters and she really has loved working on this book. We worked one chapter a week. We would start out with reading the chapter and making sure she understood the words and such. Then we would dive into the workbook. I was very happy to see the vocabulary words as they were some of the ones she was having a hard time with. It was great to have them there and she could look up what they meant. The questions were great to further go over what she read and to show she was understanding it. We would go over these orally and then I would have her to write down her answer. The activity page always gave different options, from making a time line to having writing and drawing prompts. Over all, even with the reluctant start, we loved this set and we will be continuing it to the end. The book would work well for any child that loves history and the set would work well for your history for the year. There are suggestions to add other things in to even extend it further. I do think if your child isn't a great reader even in fourth grade, you may want to hold off since it is a bit hard to say the names of people and some of the vocabulary words are a bit harder for the average reader at that age. Though the stories are super cool and of you have younger history buffs in your home you may want to think about getting it as a read out loud for the whole family to enjoy the awesome stories. Be sure to check out what my other crew members thought of it as well as other sets from Memoria Press.